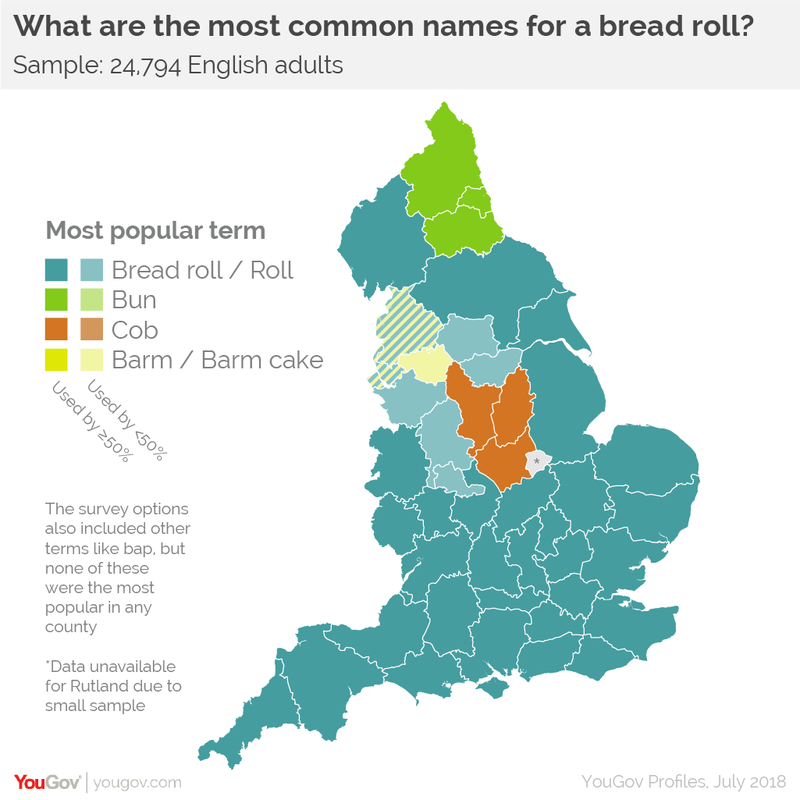 Cobs, buns, baps or barm cakes: what do people call bread rolls? July 19, 2018, 11:00 p.m. When is a bread roll not a bread roll? When you’re in the North East, North West and parts of the Midlands, according to new data from YouGov Profiles. 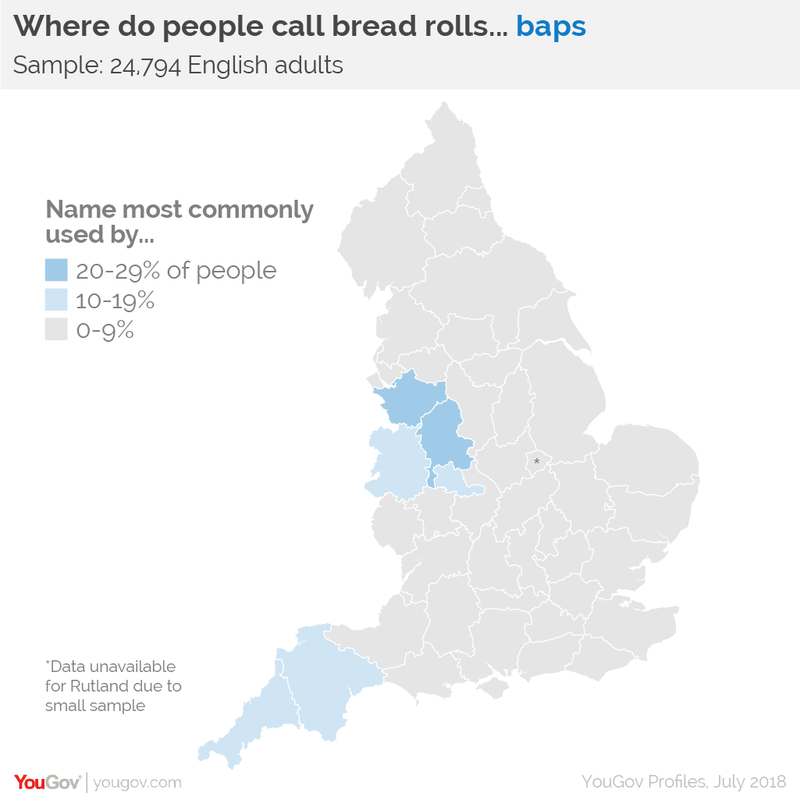 Almost 25,000 English people were asked what name they most often used for a bread roll, with the results uncovering significant regional variations. By far the most commonly used term, and the only one that is well-represented across the whole country. A slim majority of all English people (52%) say this is the name they use most often, with this figure being much higher in the counties that make up the South of England. 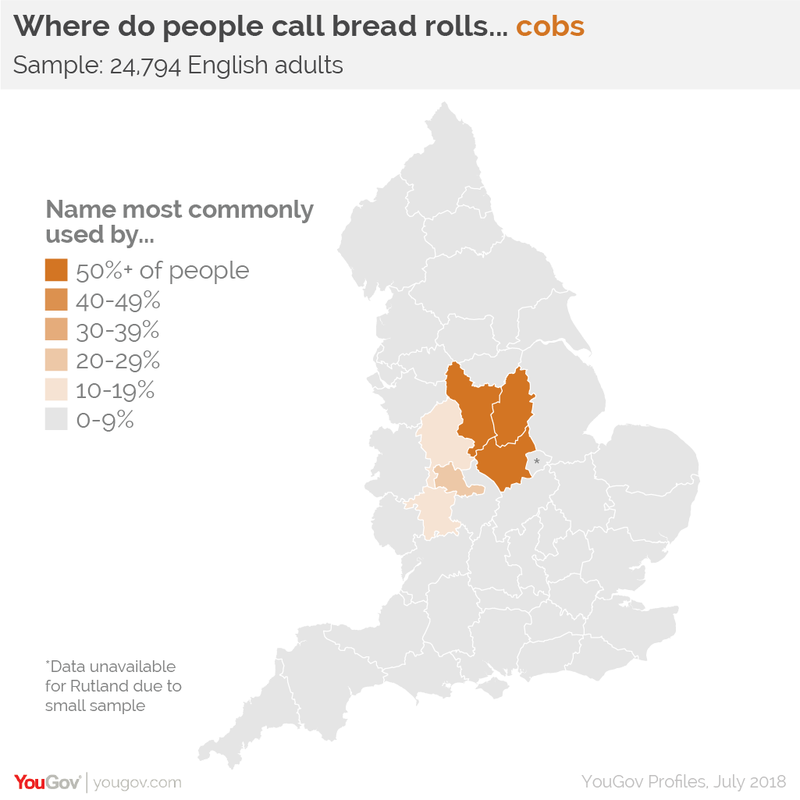 The term cob is particularly popular in some sections of the Midlands, with it being the preferred term among a majority of people in Leicestershire, Nottinghamshire and Derbyshire, as well as smaller minorities in the West Midlands metropolitan county (in the 20-29% bracket), Staffordshire and Worcestershire (in the 10-19% range). 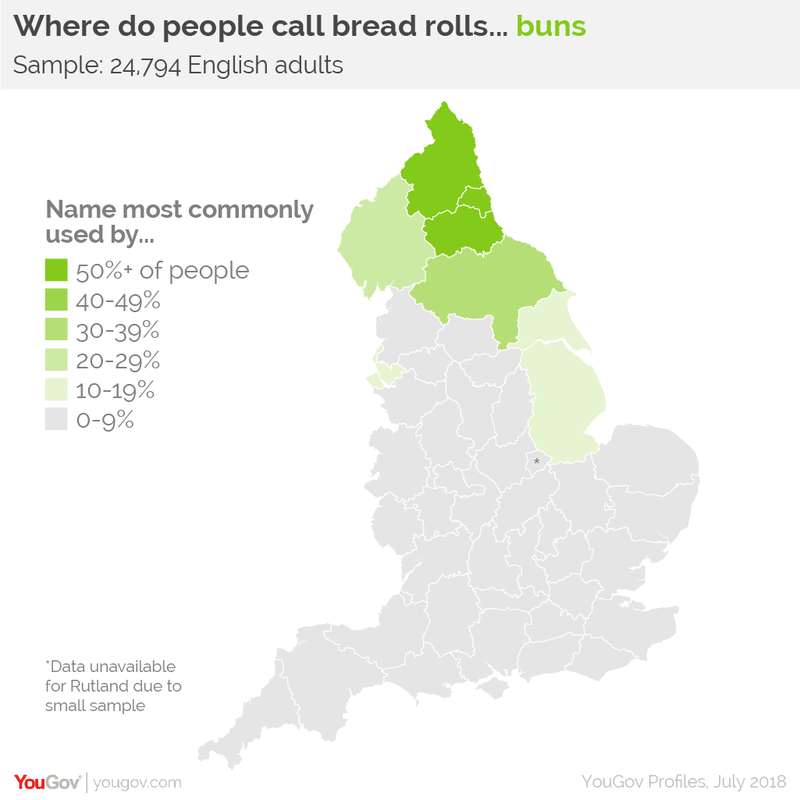 Bun is a favoured name in the North East, with the majority of people in the counties of Durham, Tyne and Wear and Northumberland being most likely to use this term. Noticeable minorities in North Yorkshire (in the 30-39% bracket) and Cumbria (in the 20-29% group) also use the term, as well as smaller minorities (in the 10-19% range) in Lincolnshire, Merseyside and East Riding of Yorkshire. The most commonly used term in Greater Manchester, although because there is such a diversity of names used in Manchester this only amounts to between 30-39% of Mancunians. 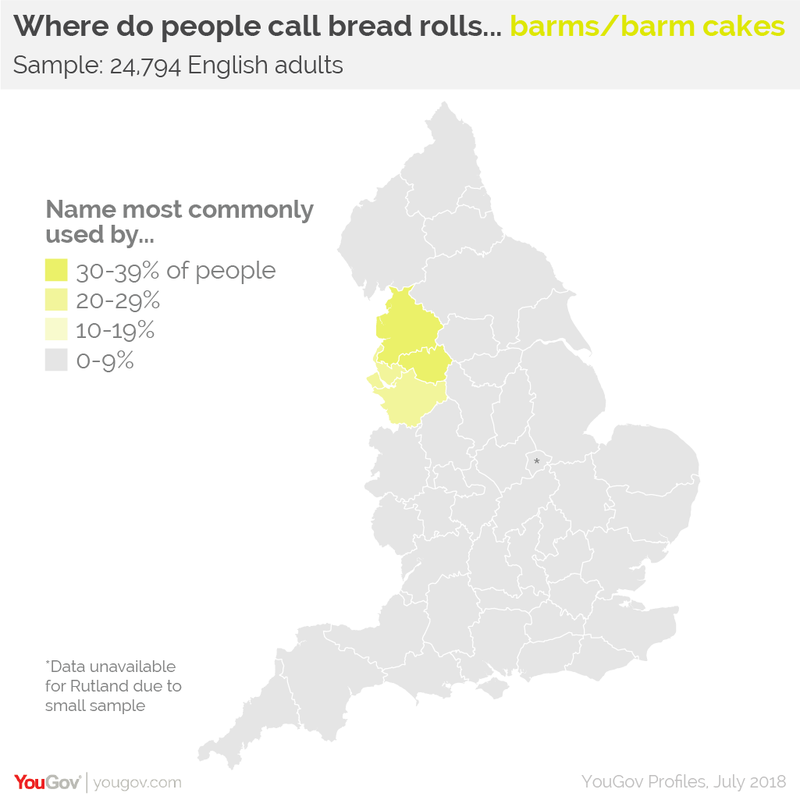 The name is also relatively popular in Lancashire (in the 30-39% group) and Merseyside (in the 20-29% range), where it ties for first place with bread roll. The term also falls into the 20-29% bracket in Cheshire also it is not the most popular option here. While not the most popular term in any county, there are nonetheless notable minorities of people (in the 20-29% group) using the name bap in Staffordshire, Cheshire, and Shropshire – where it is the second or joint-second most common term – as well as smaller minorities (in the 10-19% range) in Cornwall, Devon and the West Midlands metropolitan county. Muffin (3%) – a term almost exclusively used in Greater Manchester (in the 20-29% bracket), where it is about as commonly used as bread roll / roll. Tea cake (4%) – the second most popular term in West Yorkshire (in the 30-39% group), with smaller minorities (10-19%) using the term in Lancashire and Cumbria. Batch (2%) – the second most popular term in Warwickshire (in the 20-29% range), with a small minority of people in Merseyside (10-19%) also using the term. 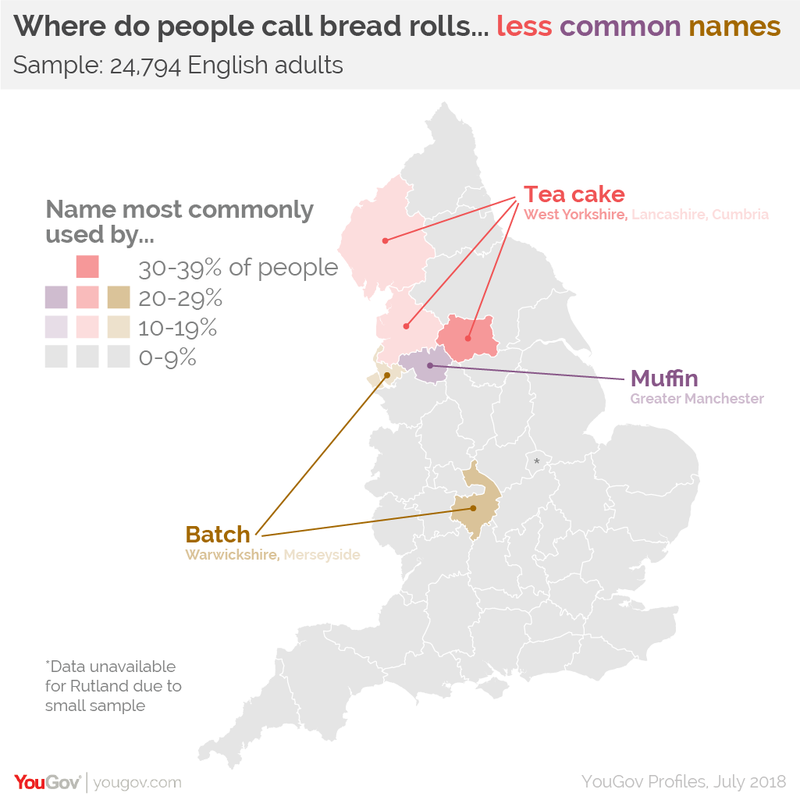 Other, other names (3%) – the list used by YouGov was by no means exhaustive and 20-29% of people in East Riding of Yorkshire and South Yorkshire answered “something else” when asked what name they most commonly used. Previous research from other sources indicates that potential candidates here could be “bread cake” and/or “scuffler” among others.